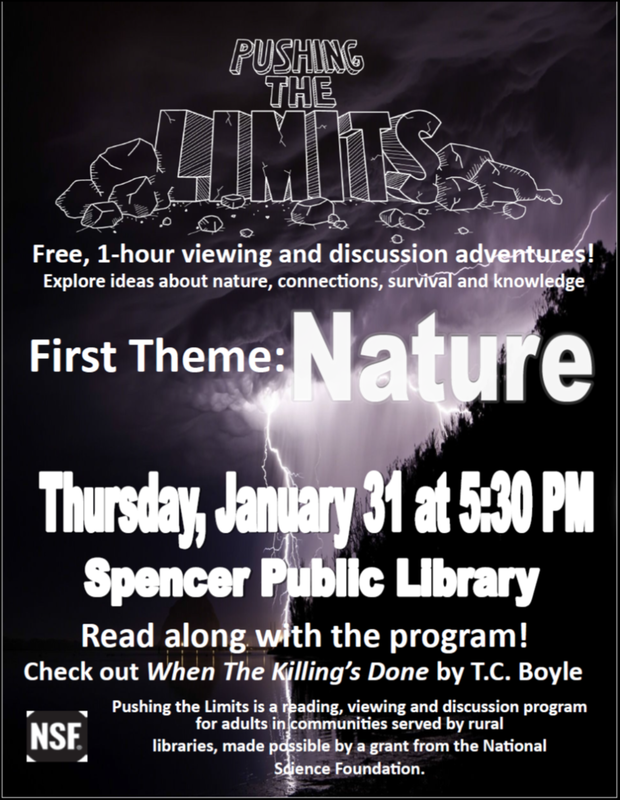 News at Spencer Public Library: Are You Willing To Push The Limits? Are You Willing To Push The Limits? We are beginning a new book discussion at Spencer Public Library called Pushing the Limits. The library received a $3,500 National Science Foundation grant from the Califa Library Group to provide science-based programs for adults! But, this isn’t your typical science based program. The Pushing the Limits programs are essentially “book club meets science café.” It is very informal and even the science challenged among us (me) will realize that science is all around us. Attendees read a pre-announced popular book selection, come to the library for an event in which they discuss the book, and then watch and discuss a short human interest video where scientific ideas touched on in the book intersect everyday life. The library has partnered with High School Science teacher, David Munson, who will guide the discussions. The first book we are reading is When the Killing’s Done by T.C. Boyle. The book discussion will happen in January with door prizes and food at the program along with free books for the first five to sign-up! Other attendees will receive books to check-out.